This past week I had the pleasure of having my father visit for the holidays. It was a great time. We explored the city, dined at my favorite eateries, and enjoyed the sweet tooth I genetically inherited from him by popping into various confection stores and leaving very, very full. When it was time to bid adieu to him, we pulled into a gas station near my house so he could fill the rental car up and avoid the surcharge. 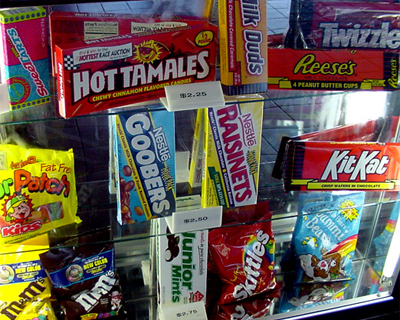 Despite this gas station being located down the street from me, I hadnâ€™t set foot in it a long time, but remember finding a slew of great candy during earlier visits. As he paid the clerk, I browsed the candy aisle and scanned it for something out of the ordinary. 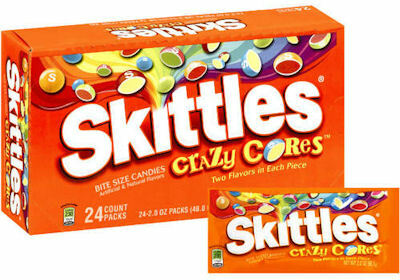 Maybe because it was Christmas Day (I canâ€™t really figure it out otherwise), but there amongst all the different flavors of Skittles sat the newest spin-off, Skittles Crazy Cores. I first learned about the upcoming release of this candy back in the fall, but I hadnâ€™t seen these in any major supermarkets or drugstores, which made my spotting them in an independently owned gas station particularly Christmas miracle-esque.